Chinese New Year celebrations have come to an end in spectacular fashion, particularly on the island of Taiwan, where Taitung City residents have been busy 'bombing' Master Handan. Every year, a local man is chosen to act as a surrogate for Lord Handan, a Taiwanese deity associated with wealth and prosperity who is believed to fear the cold. The ritual is so dangerous that it was banned for many years – but it has made a comeback in the past decade. 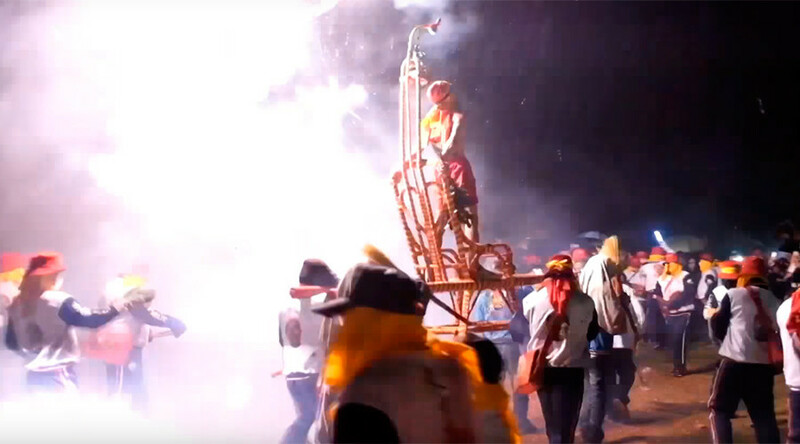 The people of Taitung City take it in turns to bombard the 'god' figure with firecrackers in an effort to warm him up and thus earn his blessings for the year ahead. While the onlookers must really enjoy this part of the festival, one can only wonder how the poor man acting as the deity can endure all the noise. Once he is sufficiently 'warmed up,' a huge celebratory fireworks display marks the end of the ceremony. Bombing Master Handan is part of the wider Lantern Festival which is celebrated across China, Hong Kong and Taiwan with children releasing lanterns into the night sky. The lanterns are often painted red, to symbolize good fortune.